Have you been tirelessly looking for an awesome surge protector so you can worry about nothing during your camping trips? Read this post because you will find a comparison of manufactures that make surge protectors for RVs. You will find a review of 6 surge protectors so that you will learn more about them and then you can take your pick. Even if a basic surge protector is a lot better than not having one at all, you should still buy an electrical management system or EMS so you will have the highest level of protection. You will be sure that your electronics will not get damaged or ruined because of surge problem. After you have read this guide, you are going to be ready in buying a new surge protector and choose one of the products reviewed here. Is it Really Necessary Protect Your RV? Do Joules Play an Important Role in Determining Product Quality? In terms of surge protection for RVs, only 2 manufacturers come to mind and these are Technology Research and Progressive Industries because both of them are EMS makers so your motorhome are always protected. Not only for motorhomes, but also for toy haulers, travel trailer and 5-wheelers. As well protection against electrical issues of the shore power. In reality, there is an assumption that progressive industries beat other manufacturers and there are specific reasons why that can be said. You can check out the chart below so that you can see the comparison between products made by these 2 manufacturers. It will be easy for you to realize why progressive industries is the top-rated manufacturer of surge protectors. The chosen brand to give the ideal power protection for your RV which is shown in the chart is Progressive Industries. Technology Research is a brand that only comes close to what Progressive Industries could produce. You will find products below that are good surge protectors and worth buying if you are looking for real power protection. These are high quality for a portable 30 amps or 50 amps that can be mounted on any rig that has the same range of electrical service. This one was chosen because of the well-made products and their customer support is very responsive. The warranty they provide is lifetime and they are all made in the USA. This product from Progressive Industries is fully portable that provides the much-needed electrical protection for RVs that have 30 or 50 amps to give. 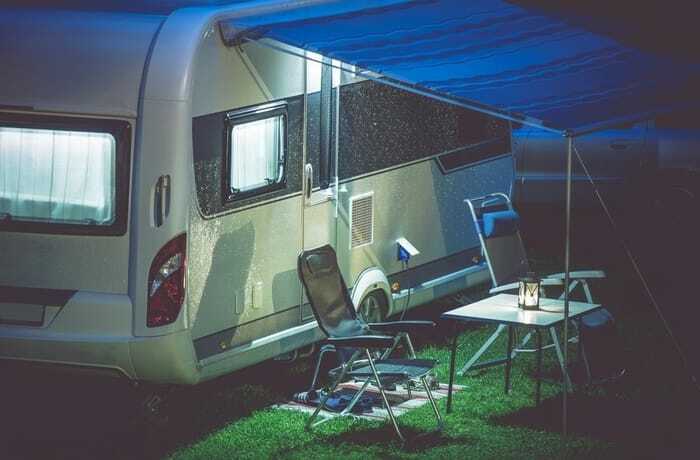 Aside from giving the best surge protection, it can point out a wide spectrum of electrical issues and your RV’s power will be shut off right away if necessary. The Progressive Industries EMS-HW30C and the HW50C EMS both give a full electrical protection in RVs that use about 30 or 50 amps service that is electrical. Both of these offer an equally strong protection that the EMS-PT30X and the EMS-PT50X can give, but they are in the version of hardwire. This means that either of them can permanently be mounted in your RV. You will find below an actual comparison of the products mentioned above that are all made by Progressive Industries. They are more expensive compared to the price of their competitor, but they have an exceptional support, a warranty that is lifetime, and the quickest disconnect in case there is danger. Electrical situations are not a joke and you need to make the best choice because it will protect you and your motorhome. 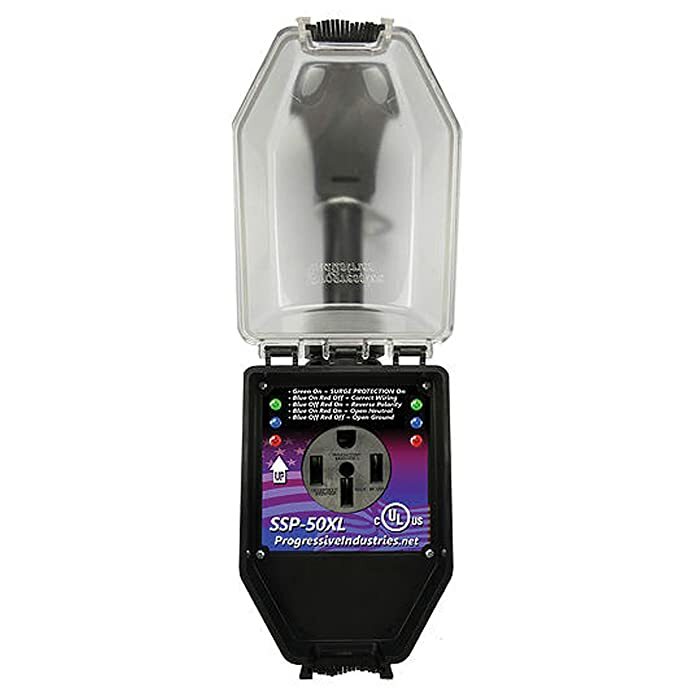 The product is able to the provide same capability as the portable TRC Surge Guard model 34830 and 34850, but this one is mounted in the RV permanently which is hardwired inside RVs that use 30 or 50 amps of electrical service. These EMSs keep your power from experiencing voltage spikes and will disconnect the power automatically if there is a problem that has been detected in the pedestal wiring of the electrical. The 44260 and 44270 both only offer a surge protection that is basic for any RV that require 30 or 50 amps. The protection they give is only the active type to go against voltage spikes like the ones caused by lightning. It can be tricky to talk about RV surge protection because the manufacturers really take note of the amps, voltage and joules that are like the fancy terms you only learn in school. There are even those who never had a class that tackled this in its lessons. The shore power protection against electrical issues is not necessarily difficult to fathom. Keep reading so you will everything you need to know about the surge protection made for RVs. You might come across statements from people that say they never had a problem in their 30+ years of camping without using any surge protector. On the other hand, there are people who accidentally plugged something without any surge protector and their entire rig got fried. All it takes is one mistake to lose everything in your wiring and the electronics are doomed for good. Remember that you invested thousands of dollars when you bought the RV and it is only justifiable why you need to spend on a surge protector. Avoid listening to those who tell you that it is totally fine not to have one because anything can happen. 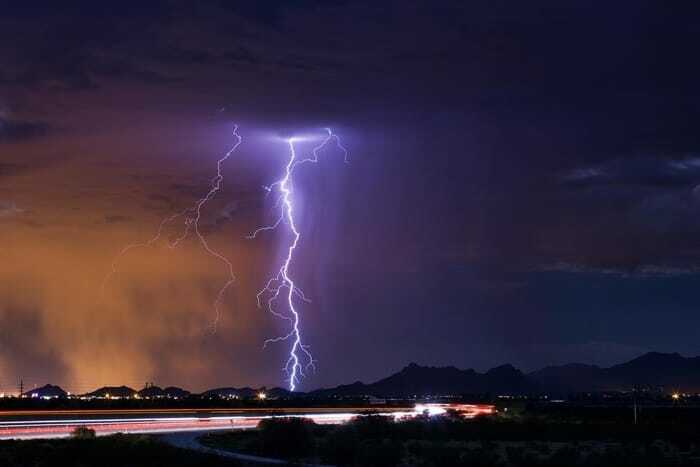 Electricity is what makes everything inside the RV function and if there is bad weather, lightning can strike your RV and you are going to regret it if you do not have a surge protector. The funny thing is you are going to encounter campground owners who are going to stare at you and make you feel crazy because you are trying to show them an outlet that has reverse polarity or something else. You should not give a fuss about them and they should not care in the first place because you might even be giving them information they really need. Even if the campground received electrical work before, it does not mean it was done the right way. Keep in mind that there are some electrical men who take advantage of the owner’s ignorance and make them believe they really know what they are doing just so earn some cash. Maybe the electrical man did not really what was wrong. It could also be that he did not receive proper training and only read books or watched videos to guide him through. This is not good and he should not be doing any campground wiring at all because this could be dangerous. Although, this can still happen a lot and this is an irresponsible way to protect campers. The next group of campers that visit the site which could include you could become a victim of what the electrical man did. Another thing about this is campground owners are not held liable in case anything in your rig gets fried. You will not be able to sue the owners for this so no one is going to deal with the damages except you. This is the reason why you need to protect your RV against power surges wherever you go. It cannot be reiterated enough that you need to protect yourself against any damage that may occur when you are using the shower with a hardwired or portable EMS. There are a number of ways the electronics in the RV can get fried while it is linked to the power at the campground and this can cause damage to any electronics or wiring in the RV. The most common problem of power surges is lightning and this leads to a big voltage spike that is going to put your surge protector to the test. In order for you to avoid any damage that may occur, even if there is an RV surge protector installed or mounted, unplug it until there is no threat anymore. Although, an EMS or surge protector should be powerful enough to give your RV protection. Although, your device might get fried that will force you to buy a new one. This can actually happen and there are various reasons why it does. There is a wiring that has been changed, something came loose or was not installed properly. It is difficult to determine electricity and some people admit that it has its complications. All it requires is an electrician who does not know what he is really doing and you can be the victim of this. There are stories found online that are about adding the wrong voltage, and even about electricians who think that the 30 amps are no different from the wattage found in the dryer’s plug. This is not true because dryers use 240 volts, but RVs only run on 120 volts. No one deserves to become a victim of this, especially if you have been dreaming of this vacation for a long time. Nothing should ruin your trip and RVs are not cheap so taking proper care of them is important. You should never ever plug a 30 amps RV in an outlet that is meant for dryers made for standard homes. This is going to guarantee that you are going to spend a lot in electronic replacement. This is frustrating because it is easy to read guides about this and as an RV owner, it is your responsibility to know significant knowledge about RV protection. Not being aware and neglecting to do your assignment could cost you thousands buying replacements for all of the broken electricals inside your RV. One of the most common horror stories of camp ground owners is when they encountered an electrician who, at first, seemed to know what he was doing. It turns out that the electrician only read books or watch videos without any real training. They think that campground wiring can be done without any professional experience. Some electricians would even use the dryer outlet to put the wiring, which is totally wrong. A lot of people become victims of this because they do not know that they are being misled. This is bad business for the campground owners and dangerous for campers because their rig can get fried. Some RV owners even experience feel a little tingling sensation just by touching the frame of their RV. This is a sign that the wiring was done incorrectly and needs to be fixed right away before anyone else feels it. The electrician should always be someone who is experienced in handling RVs because making this mistake could cause you thousands. Listening to what the electrician claims to know is not enough. You always need to find out if he is really professional in what you will ask him to do. During summer time, it gets very hot and you park in the campground with other RVs that consume a lot of energy because of the air conditioning which can cause the power supply to become slim. This is especially true in older camping parks where they failed to update the wiring that’s been there since the 70s or 80s. This is considered a brownout and you do not want this to happen because it will ruin your vacation. If your RV does not have the right voltage, your electrical system can seriously be damaged. This occurrence is not rare in parks that are overloaded. It is important for the health of your rig to gain RV surge protection that is going to turn off power on its own at a significant time. 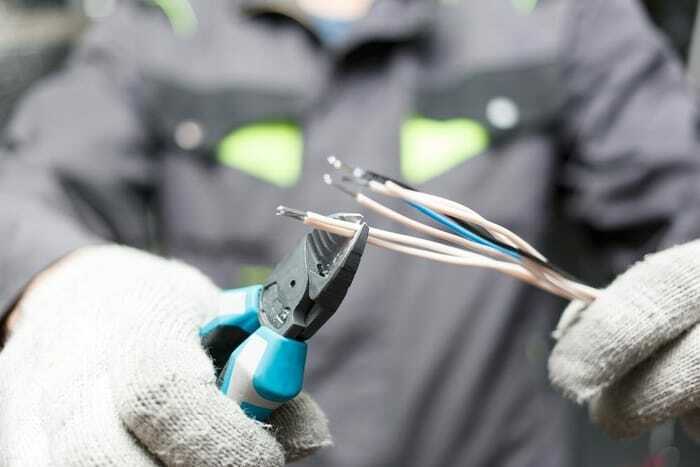 Prior to plugging anything in, you must check the voltage and wiring to avoid any problems. Although, you must take note that the voltage is a constantly changing entity. There could be a drop or surge anytime making it a lot more dangerous. You are putting your RV in danger if you do not have something to monitor this at all times. An EMS will keep your RV from being damaged by a power surge in any given situation. Think about what a low voltage could cause and from this thought there are a lot of considerations you need to make. You can now think of losing your refrigerator, inverter, converter, television, or the furnace. Also included in the list your TV, batteries, computerized propane detector, water pump, or anything being used to connect all of the rig’s wiring. If you think about the cost as early as now, you will realize it can amount to thousands of dollars. Protecting it as early as now is what you need to do. You get insurance for your house, car, and your RV. Although, does your insurance plan cover the power surges caused by a voltage? Probably not, and even if it does, dealing with the insurance can be a hassle just to have everything changed. No one wants to spend more and has their vacation ruined because something like this happened. People who are okay with this probably do not care about the money they will spend because of damages, the time wasted during their camping, or even the trouble of dealing with their insurance company. For sure you are not one of those people who does not care because you are reading this post and you love your RV. You have to prevent damage from happening no matter what happens. This is why getting a surge protector from Progressive Industries or Technology Research is what you need to do. Both types were reviewed in this post and you need to continue reading to make everything clear to you. Surge protectors are probably what you already heard of or have used. You might be using a power strip where you plug all of your devices at home. There is a possibility you are already using a surge protector and it does its job when there is voltage spike to avoid any damage to your things. RV surge protectors function the same way and its main purpose is to prevent voltage spikes from happening, which is usually because of a lightning strike. On the other hand, an EMS is for other types of power problems. 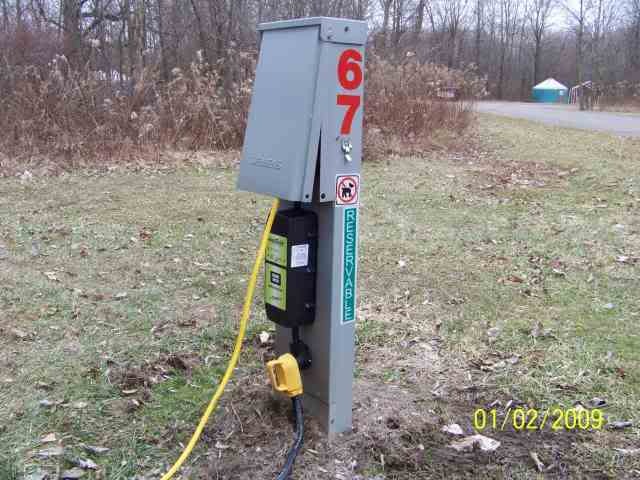 There will be reviews of RV surge protectors below are good for telling you if the area has an open ground, neutral or polarity issue in the area. 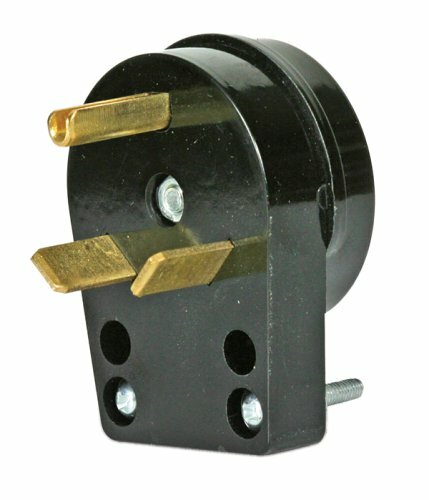 These will not keep you from plugging the RV with a faulty pedestal. They are only for indicating an issue, but will not stop working. You are the one who will look at the LED indicators so you can decide if plugging the rig in the outlet is safe. An EMS is the best type of RV surge protector because it is totally different and works great. This is what you need to use because unlike a normal surge protector, it protects you against dangerous electrical situations. To determine what your rig is, check what’s on the power cord. If there are 3 prongs, it means your rig is 30 amps and if there are 4, it is 50 amps. Always buy the right surge protector and make sure your power cord does not have an adapter attached to the end. Aside from other features in surge protector reviews, there is a joule rating indicated. The joule rating of Technology Research products is higher compared to the ones from Progressive Industries. 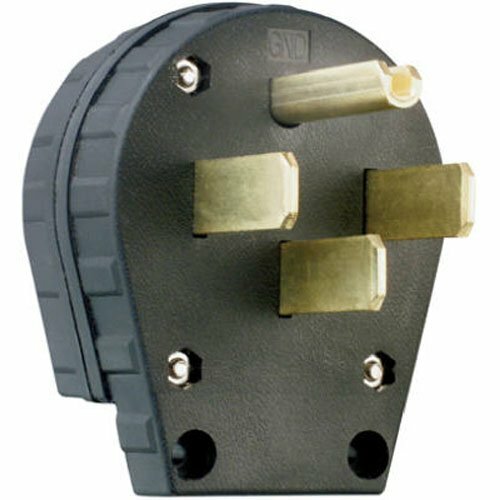 In RV surge protectors, joules stand for how much energy it can take in and dissolve to heat. This is important in the occurrence of a voltage spike or power supply surge. If the joule is rating higher, then this is better. Look at the response time of the surge protector because this will tell you how fast it will respond in the event of a voltage spike. You want this number to be small so your RV does not get damaged. The response time of Progressive Industry units is less than 1 nanosecond. The portable ones are what is to be plugged into power pedestals. You can plug them into the pedestal’s female outlet, then your power cord can be connected to it. The hardwired protector is permanently installed inside the RV. It goes between the power pedestal and your rig’s electronics. Even if their products are costlier, the customer support and lifetime warranty explains why they are priced higher. Another thing about them is that they are only made in the USA. Always spend on an EMS than a surge protector even if it costs more. This is because it is more expensive to replace all of the electronics in the RV than to spend a little higher on an EMS. Owning an RV and parking in campgrounds is an exciting way to spend your holiday, but you should always be prepared for anything. It is a trip you anticipated for quite some time, so make sure you have everything you need and protect your electronics against any power surges. You should be enjoying the trip without any hassle.